Loneliness is an old and much used concept but its content is often not understood. My interest in the phenomenon of loneliness began during my master studies years ago. I made a concept analysis of the concept of presence in a nursing relationship context and I found loneliness as the opposite concept of loneliness. I had recognized the phenomenon of presence and loneliness in my patients in intensive care units. There was a clear difference in how the nurse was present at a patient bedside. My professors recommended that I read the philosophy of Martin Buber. I found theoretical confirmation that this philosophy is applicable to the context of a nursing relationship between a patient and a professional nurse. I decided to explore this phenomenon in my dissertation. I was surprised that this topic was not found in other studies. Many nursing studies included loneliness without explanation, or the authors described loneliness using classical loneliness theories. I thought that the different dimensions of loneliness had quite different meanings in nursing context. So I had no other option than to pursue an evolutionary concept analysis and to find out the uses of the concept of loneliness in the nursing and health care context. As well, from a nursing point of view, it is very significant to understand dimensions of loneliness in the context of nursing relationships. This evolutionary analysis served as the basis for my qualitative and quantitative research, which I have continued together with my dissertation supervisor Marja. I hope you will read this interesting article, then return here to share your comments! The essential purposes of ANS are to advance the development of nursing knowledge and to promote the integration of nursing philosophies, theories and research with practice. We expect high scholarly merit and encourage innovative, cutting edge ideas that challenge prior assumptions and that present new, intellectually challenging perspectives. We seek works that speak to global sustainability and that take an intersectional approach, recognizing class, color, sexual and gender identity, and other dimensions of human experience related to health. 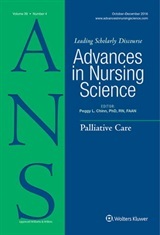 Advances in Nursing Science Blog by ANS Editor is licensed under a Creative Commons Attribution-NonCommercial-ShareAlike 4.0 International License. Permissions beyond the scope of this license may be available at https://ansjournalblog.com/contact/. The ANS Blog provides a forum for discussion of issues raised in the articles published in Advances in Nursing Science. We welcome all authors and readers to post your comments and ideas on the blog! If you would like to be an author on this blog, let us know! The journal Editor is Peggy L. Chinn, RN, PhD, FAAN. Dr Chinn founded the journal in 1978.